Innovation Crossroads is a new accelerator for clean energy entrepreneurs at Oak Ridge National Laboratory. Left to right: Tom Rogers, Charlie Brock, Moe Khaleel, Thomas Zacharia, Mark Johnson, Thomas McDonald, Philip Taynton, Johanna Wolfson and Beth Papanek. 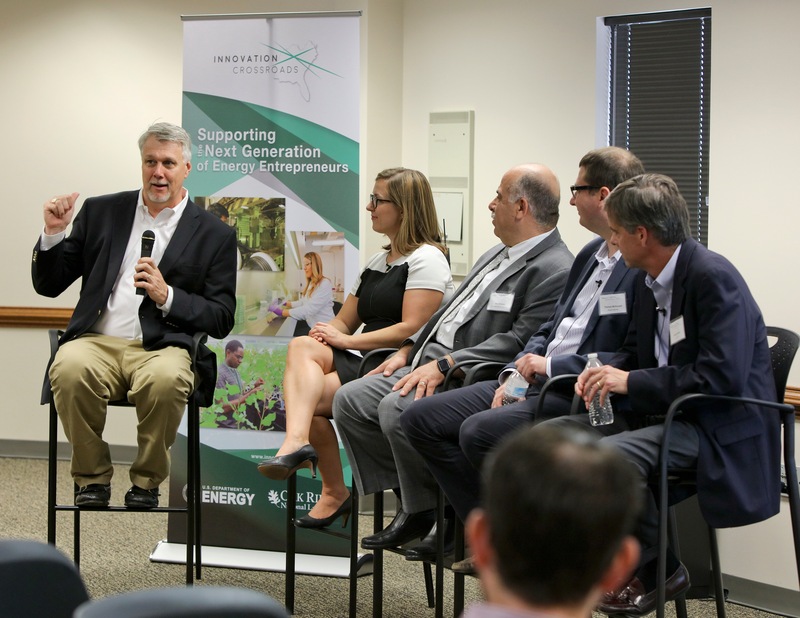 Mark Johnson, Johanna Wolfson, Moe Khaleel, Thomas McDonald and Charlie Brock participate in a panel discussion about Innovation Crossroads, a new accelerator for clean energy entrepreneurs at Oak Ridge National Laboratory. OAK RIDGE, Tenn., Sept. 20, 2016—The nation’s top innovators will soon have the opportunity to advance their promising energy technology ideas at the Department of Energy’s (DOE’s) Oak Ridge National Laboratory (ORNL) in a new program called Innovation Crossroads. Up to five entrepreneurs will receive a fellowship that covers living costs, benefits and a travel stipend for up to two years, plus up to $350,000 to use on collaborative research and development at ORNL. The first cohort is expected to start the program in early 2017. A growing global population and increased industrialization require new approaches to energy that are reliable, affordable and carbon neutral. While important progress has been made in cost reduction and deployment of clean energy technologies, a new program at DOE’s Office of Energy Efficiency and Renewable Energy (EERE) will invest in the next generation of first-time clean energy entrepreneurs to accelerate the pace of innovation. "There is a huge opportunity and need to develop an emerging American energy ecosystem where cleantech entrepreneurs can thrive," said Mark Johnson, director of EERE’s Advanced Manufacturing Office (AMO). "This program gives the next generation of clean energy innovators a chance to make a transformative impact on the way we generate, process and use our energy resources. Innovation Crossroads will play an important role in strengthening the Southeast region's entrepreneurial ecosystem." Located on ORNL’s main campus, Innovation Crossroads entrepreneurs will have access to ORNL's world-class research talent and DOE facilities including the Manufacturing Demonstration Facility, the National Transportation Research Center, the Oak Ridge Leadership Computing Facility and the Spallation Neutron Source. Through a partnership with mentor organizations in the Southeast, participants will also receive assistance with developing business strategies, conducting market research, and finding long-term financing and commercial partners. 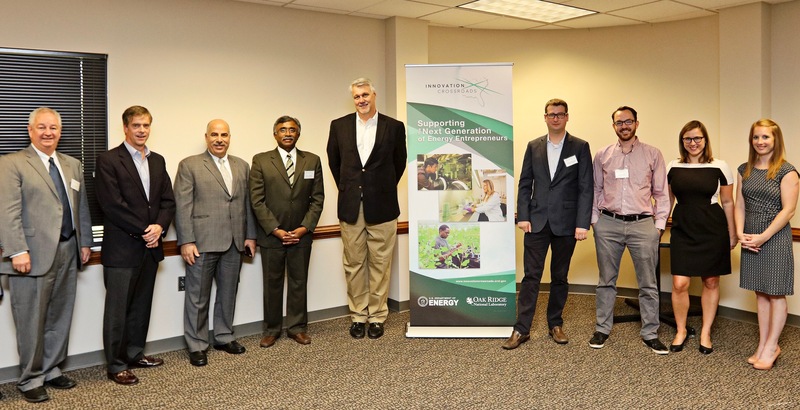 Innovation Crossroads is part of EERE's Lab-Embedded Entrepreneurship Program (LEEP), sponsored by EERE's Advanced Manufacturing Office (AMO) and co-managed by EERE’s Technology-to-Market Program. LEEP includes Lawrence Berkeley National Laboratory’s Cyclotron Road and Chain Reaction Innovations, which launched at Argonne National Laboratory earlier this year. Innovation Crossroads will be led by Tom Rogers, ORNL Director of Industrial Partnerships and Economic Development. The U.S. Energy Department's Office of Energy Efficiency and Renewable Energy accelerates development and facilitates deployment of energy efficiency and renewable energy technologies and market-based solutions that strengthen U.S. energy security, environmental quality, and economic vitality. EERE's Advanced Manufacturing Office (AMO) supports applied research, development, and demonstration of new materials, information, and processes that improve American manufacturing’s energy efficiency, as well as platform technologies for manufacturing clean energy products. AMO works closely with EERE’s Technology-to-Market Program on initiatives that accelerate clean energy technology innovation and commercialization.